A church differs from a typical business in a number of ways. For one thing, a church may be held liable for violating canon law as well as common and statutory law. Another difference is that churches perform their work primarily through volunteers rather than paid employees. Yet, churches also have many of the characteristics of a for-profit company. Like businesses, most churches own property that may be lost, damaged or stolen. Many own vehicles that may be involved in auto accidents. Like businesses, churches need insurance so they can protect their assets and continue to serve their mission. Churches seeking insurance may have several sources of coverage. Very large churches may save money on insurance premiums through self-insurance. Small or mid-sized churches may purchase coverage from a standard property-casualty insurer. Another option is to purchase coverage from a specialty insurer such as Church Mutual and Brotherhood Mutual. Both standard and specialty insurers offer products designed for churches. Many sell package policies that include coverages churches need such as property, liability, and auto. All churches need property insurance. A commercial property policy will protect your organization against loss or damage to church-owned buildings and personal property. Church property may be insured for its actual cash value or its replacement cost. Which option is better depends on the age and condition of your building. Coverage based on actual cash value may be appropriate for an older building that is not in good condition. Don't choose this coverage simply as a cost-saving measure. It won't cover the full cost of repairing or replacing damaged property. Most churches should be insured for their replacement cost. If you choose an adequate limit, replacement cost coverage should provide the funds you need to rebuild your church if it is completely destroyed by a fire or other insured peril. Another coverage you should consider buying is building ordinance insurance. It covers the extra costs you incur to repair or reconstruct your building to meet current building codes. Without this coverage, your church may incur large out-of-pocket reconstruction costs. All property your church owns should be covered under the property policy. To be sure nothing is omitted, make a list of all church-owned property. Your list may include halls, meeting rooms, parsonages, and education centers. It may also include living quarters inhabited by a pastor or other members of the clergy. Religious artifacts, stained glass, statuary, paintings, scriptures, prayer books, and other valuable property should be inventoried and listed on a separate schedule. These items can be covered by fine arts insurance. Churches are not immune to crime. Some of the most common crimes committed against churches are burglary, vandalism, arson, and theft of cash by employees. Burglary, vandalism, and arson are covered perils under most commercial property policies. Employee theft coverage will protect your church against theft of money, securities, and other property by church employees. Some insurers will extend the definition of employee to include volunteers. Many churches use computers to purchase supplies, maintain accounts, and communicate with parishioners. Your property policy may not provide adequate coverage for your computers and data. If it doesn't, consider buying electronic data processing coverage. In the past, religious organizations were immune from tort liability. Nobody could sue a church for injuries sustained due to the church's negligence. Times have changed, and most church immunity has been eliminated by the courts. Nowadays, churches are subject to many of the same types of lawsuits that affect for-profit businesses. Churches are particularly vulnerable to suits involving injuries to children. General liability insurance protects a church against claims by third parties for bodily injury, property damage, and personal and advertising injury. A church's liability policy should cover employees, volunteers, church officials, staff, and church members as insureds. Many churches allow outside organizations to use church-owned facilities for meetings, classes, and other purposes. If your church permits other organizations to use church-owned property, be they have purchased liability insurance. Insist that each organization provide a certificate of liability insurance. Church pastors who provide spiritual counseling may be held liable for physical or emotional injury to church members. To protect their pastor, churches need pastoral counseling liability insurance, a type of errors and omissions insurance. Likewise, a church that performs burials or cremations should protect its cemetery staff by purchasing cemetery professional liability coverage. Churches should also consider buying directors and officers (D&O) liability and employment practices liability (EPL) coverages. D&O insurance protects directors and officers against claims alleging they committed wrongful acts while serving on the church board. EPL insurance covers claims by employees alleging discrimination and other employment practices. Some additional liability coverages a church should consider purchasing are outlined below. Sexual Abuse and Molestation. Covers claims alleging illicit physical contact or exploitation of a minor child by an insured individual. May be written separately or added to a general liability policy. Employee Benefits Liability. Covers claims against your church that result from errors in administering employee benefits. May be added to a general liability policy. Teachers Liability. Covers wrongful acts, including corporal punishment, committed by your teachers against students. Umbrella Liability Available as a separate policy. Provides extra limits over those afforded by your primary general and auto liability coverages. Churches often own vehicles that are used to conduct church business. Some furnish a vehicle to the pastor. At many churches, parishioners drive their personal autos on behalf of the organization. Thus, most churches need a business auto policy that includes coverage for non-owned autos. Some churches own buses or vans that they use to transport parishioners. Such vehicles create serious liability risks. To ensure they are operated safely, buses and vans must be maintained properly. Careful driver selection and training are also essential. Note that a bus or van is subject to federal regulation if it travels across state lines and is designed to transport more than 15 passengers (including the driver). If you aren't sure what requirements may apply to a particular vehicle, ask your agent or broker for assistance. Churches that employ workers are generally obligated by law to purchase workers compensation insurance. This coverage ensures that workers injured on the job will receive the benefits to which they are entitled under state law. In a few states, churches are exempt from the requirement to buy workers compensation coverage. Even if this coverage is not required, a church should consider purchasing it voluntarily. Voluntary compensation coverage serves as a hedge against lawsuits. It provides injured workers the benefits they would have received had they been covered by state law. A worker who accepts those benefits is barred from suing his or her employer. Health Insurance - your church may need to offer health insurance as a benefit to attract clergy or for permanent employees. Travel and International Operations - your denomination may minister or send missionaries overseas and you will want to consider this coverage for those operations. The focus of this article is on smaller churches. 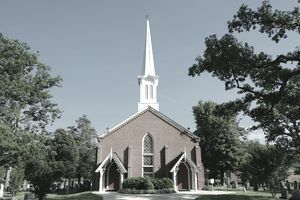 Larger churches may need different coverages and may benefit from some aspects of their operations being self-insured. Larger churches may operate schools, daycare, or retirement facilities. Such large operations may benefit more from the service of a broker instead of an agent as some of these operations require specialized coverage on their own. Which Risks Worry Business Owners the Most?